As the Commissioner of Entrance Examinations published the trial allotment for admission to the Engineering/Medical/Architecture courses in Kerala for the academic year 2014-15, it is important to know the last rank details. After the announcement of the trial allotment, candidates with rank upto 536 possibly will get allotment for MBBS seats while the last rank for Information Technology is 9488 in government colleges under State Merit. Like the previous years, the Government Medical College, Kozhikode found to be the most favored medical college under State Merit for MBBS. The candidates with rank up to 200 got SM allotment at this college. 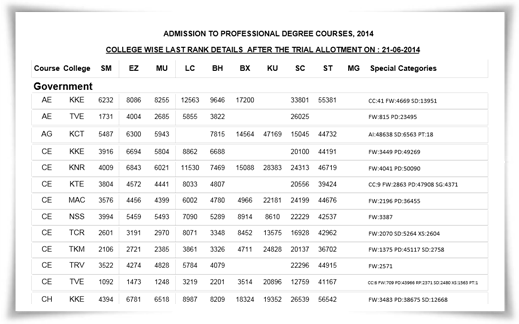 Trivandrum Medical College comes second as the last rank here is 229. The last state merit allotments in other colleges are as follows: Kottayam(364), Thrissur(439), Cochin Medical College(516), Malappuram –Manjeri(534) and Alleppey(536). Under the category list, candidates with rank up to 1256 in the Ezhava category (EZ) and candidates with rank up to 806 in the Muslim category, can get MBBS seats under state merit in government medical colleges for the academic year 2014 -15. It is known that the last rank for BDS under state merit is fixed at 1233. Regarding Engineering, the most favourite course is Mechanical Engineering while College of Engineering, Thiruvananthapuram rank one as the most preferred college. The last rank for Mechanical Engineering at College of Engineering, Thiruvananthapuram is 209. Coming to Information Teehcnology, the last rank which got allotment under state merit is 9488. It is also important to know the last rank details about various branches in government engineering colleges under state merit. The last rank details of other branches are: AE (6232), AG (5487), CE (4009), CH (4394), CS (5337), DS (6495), EC (4636), EE (4495), FE (7651), IC (6765), IE (4087), IT (9488), ME (2386), MP (4707) and PE (4954). Candidates with rank up to 12745 under the Ezhava category (EZ) and candidates with rank up to 121555 in the Muslim category are likely to get engineering seats under state merit. As the trial allotment is an gateway to be familiar with the admission process, students need to wait for the first allotment to know the final result. As the option registration facility comes to an end on 23rd June, the first allotment would be published on 25th June 2014.